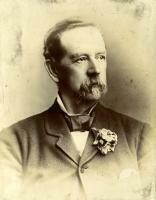 Gerald Du Val was born on 27 October 1840, the son of Charles Allen Du Val and his wife Elizabeth Renney. He was baptised in Manchester Collegiate Church on 19 January 1841. In 1865 he married Catherine Shimwell in Manchester. She was born in Manchester in 1844, and was called Kate in the family. When the Census was taken in 1871 they were living with their children at 246 Plymouth Grove, Chorlton-on-Medlock in Manchester. Gerald Du Val was then recorded as being an artist and photographer. In 1881 and 1891 they were living at 284 Dickenson Road, Rusholme in Manchester. By 1891 Gerald Du Val was recorded as an artist. Allen Du Val. He was born in December 1866, became a chemist, and emigrated. Lucy Du Val. 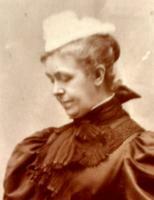 She was born in March 1869, and married Edwin Temple-Smith. She died in 1934. Gerald Shimwell Du Val. He was born in 1870. He had been a private soldier in the 1st King's Own Dragoon Guards, but was at his parents' home when he died on 8 February 1898 from a fall while sleepwalking. An inquest was held on 10 and 17 February 1898. Bessie Du Val. She was born in 1872, and married her cousin George Kipping. She became a well known artist and illustrator. She died in 1959. Blanche Du Val. 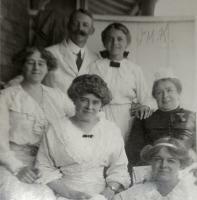 She was born in 1875, and married Norman Melland. Bartram Du Val. He was born in 1877. He was the father of the eminent mathematician Patrick Du Val 1903-1987 (1). Denis Du Val. He was born in 1879. He emigrated to the outback of Australia. He joined the Australian Imperial Force on 4 December 1914, serving as a Corporal in the 10th Light Horse Regiment. He embarked in February 1915 and was killed in action at Gallipoli on 7 August 1915 (2). In the various censuses Gerald Du Val is described as an artist or as an artist and photographer. In 1869 he exhibited a portrait at the Royal Manchester Institution (later to become Manchester Art Gallery), but nothing more is known about his art. Gerald Du Val died in 1895 aged only 55 years. The family had lived in the Chorlton-upon-Medlock area of Manchester, but after his death they dispersed all over the world. His wife outlived him by many years, and died aged 88 years in Manchester in 1932. (1) A full obituary of Patrick Du Val is in the Bulletin of the London Mathematical Society volume 21 (1989) at pages 93 to 99 by J.A. Tyrrell of King's College, London. (2) Australian War Memorial : First World War Nominal Roll Page - AWM133, 15-046.